I had the baking bug. I was itching to bake but unfortunately, I didn’t bring any of my cookie baking sheets. I didn’t bring any of my tart pans or my cake pans. I was deprived. Fortunately for me, I did bring my flute pan. Yea, I know, out of everything to choose from, why the flute pan which is quite limiting as opposed to cookie sheets? 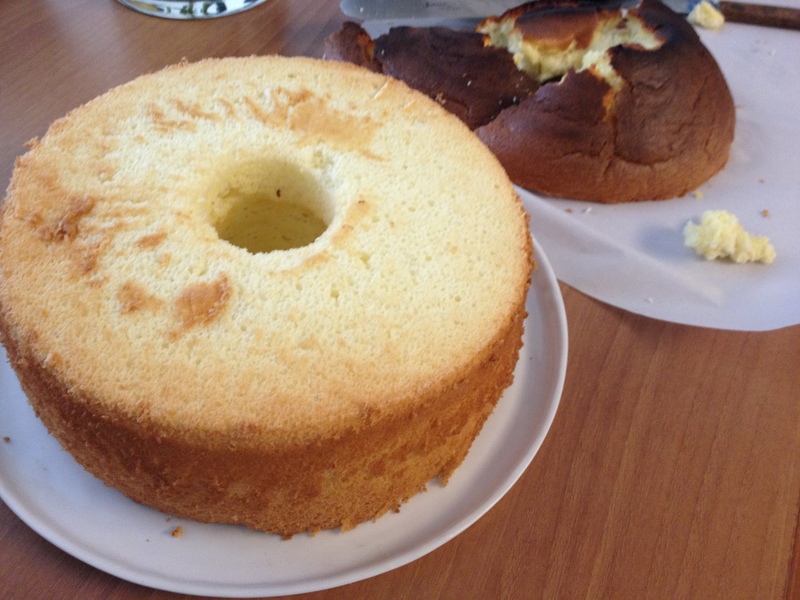 Well, I wanted to make my favorite cake, the Chinese Sponge Cake. Every time I am back at home in NorCal, I make an effort to go to the farmers market to buy fresh fruit and vegetables. I love the farmers market back at home; there’s an egg man who wears a chicken hat and sells fresh farm eggs, there’s a honey stand with an old couple who has been selling honey there ever since I was young, and then there’s also a stand where there’s this one announcer guy who always claims his corn, his apples, his cherries, whatever the season is, that his are the best we will ever taste (sometimes true, sometimes not). Ever since school started again and I’ve relocated to SoCal, I’ve been trying to find a local farmers market to buy fresh fruits and veggies. This past weekend, I decided to visit one around Knotts Berry Farm with hopes of coming home with bundles and bundles of food to last us the whole week. I was quite sad upon arrival. I counted about five stands selling fruit/veggies, and the other five stands were selling items of second hand clothing, tacos, coffee, and popcorn. Sigh. This was quite a change compared to the shoulder to shoulder, loud and crowded farmers market back at home. This was quite a change compared to my four stands of nectarines and three stands of strawberries. As I roamed the stands, I did realize another difference that I was happy with– the prices. 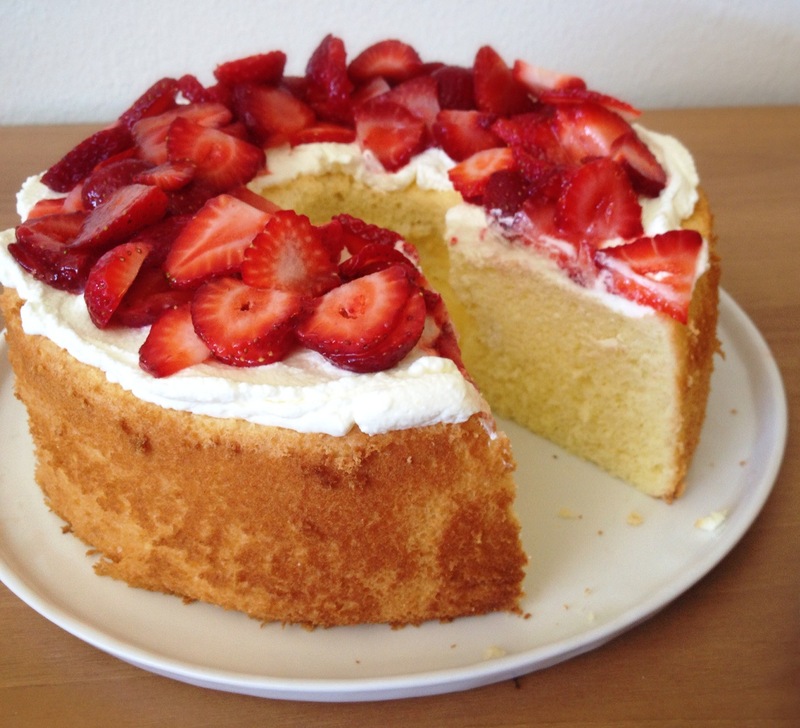 In Norcal, strawberries were $7 for three baskets, when they are in season. I wouldn’t be surprised if they are $8 right now. At this farmers market, they were $FIVE for three baskets! In Norcal, an 8 pound bag of oranges are $9. Here, $FIVE for TEN POUNDS! So while it was a small selection, it was cheaper! I walked away slightly disappointed but still feeling triumphant! 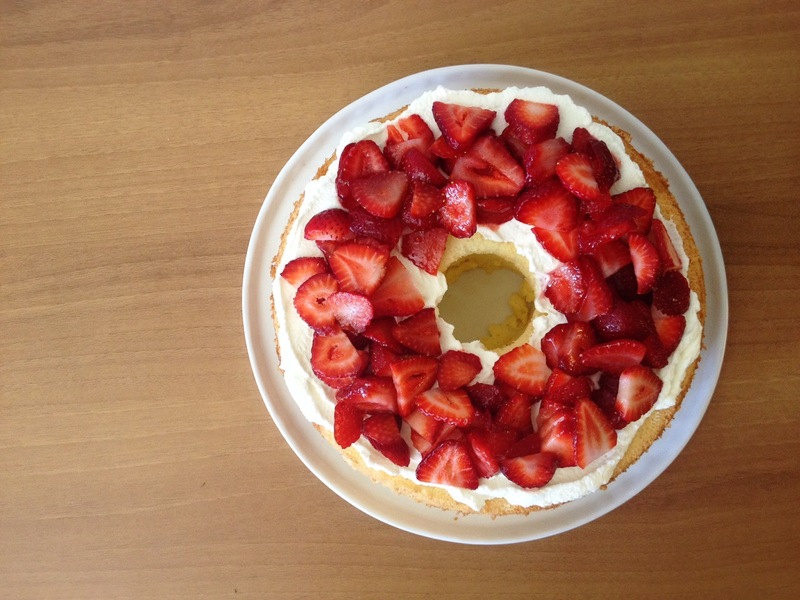 Long story short, I bought some strawberries and used it to top my Chinese sponge cake. With fresh whipped cream. P.S. I will be visiting a new farmers market next week. P.P.S. I hope they have celery. This one didn’t. Fresh Whipped Cream- whip 1 1/2 cup heavy whipping cream with 2 Tbsp of sugar until stiff peak. 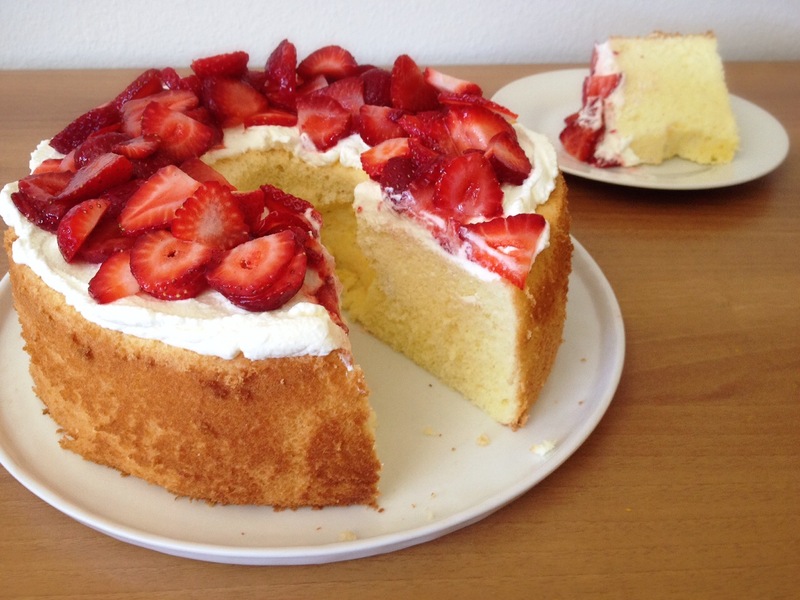 Spread onto completely cooled cake and top with freshly sliced strawberries!